The wind has been blowing pretty hard around here and I can only attribute that to collateral damage from all the hot air from the political debates creating havoc with the atmosphere. Twice now my fake garage, a Costco special temporary shelter, has been upended, turned completely around and unceremoniously deposits upside down next to the motor home. The first time it blew over was about a week ago. Being feeble, making it right was out of the question so I sent son Jeff a plea for help. He showed up pretty quickly with Marc in tow and they got it back into place very quickly. I was amazed and grateful. Considering that Jeff has shoulder, knee, and ankle issues of his own, and Marc reported that he used to be a circus midget, they did a great job. Then, the night before last, we had another wind advisory that was fulfilled and it blew away again. The Motorhome sustained a bit of scratching, but no broken glass. I was happy about that. Instead of dragging Jeff away from his tasks, I decided to take care of the problem all by myself in a way that wouldn’t put undue pressure on my overly sensitive rotator cuffs. I just dismantled the entire thing and put it in the garage. 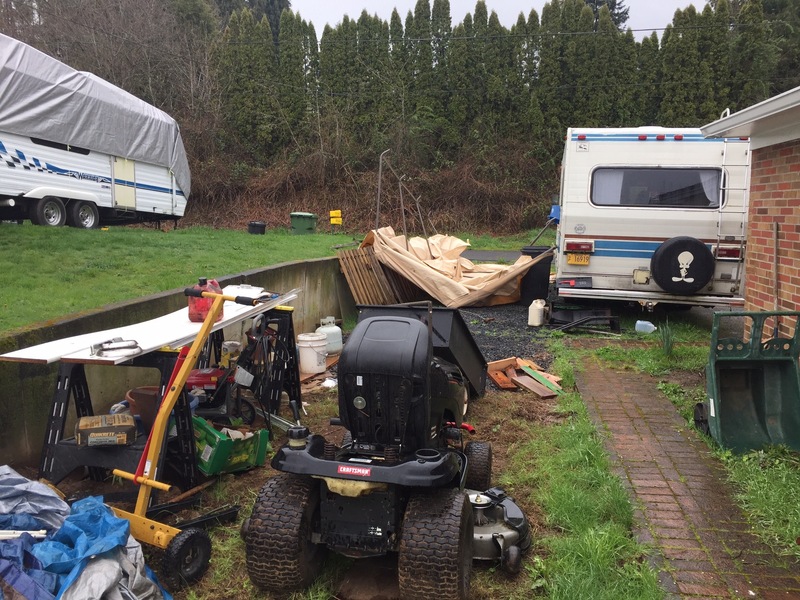 Then I covered the mower with one of the blue tarps and anchored it down with everything heavy I could find that used to be covered up by the fake garage. I did this because there’s another high wind warning, so why bother. The next time I put it up it’s going to be anchored properly. With rebar. Big rebar, driven about 10 feet into the ground on each corner. Might use some cement, too. Now, how about all the voting that’s going on? Looks like Donald is going to win the republican battle for the nomination, unless congress decides he’s not allowed to run for some reason. Like, he’s not really a politician, so why should he be allowed to run for President. That, according to some reports I’ve read, should be left to seasoned politicians that know all the tricks of the trade. I just added that last part. No one really said that. But, I think it’s one of those things that goes without saying for folks who have been in politics their entire working life. They’re there because they know all those tricks. This entry was posted in Politics, Weather. Bookmark the permalink.